Teak has been used for hundreds of years on ship decks. If it can stand up to the open sea, it can handle your shower. Teak wood is attractive, and contains natural oils that protect it from moisture. It feels good on your feet, and adds warmth to your shower. Teak has definite appeal, but comes with a few disadvantages. Teak inserts may be the most efficient use for a shower floor. The simple design fits over existing shower floors. Think of a teak insert as a wooden grid with feet. Some have anti-bacterial runners or strips on the bottom. With a planked surface, the water runs through the planks, and down the drain as it would ordinarily. They can be custom-built to fit your shower, and are removable. Planked teak shower floors are similar to inserts, except that they typically are installed from scratch, are not removable without using tools, and typically fit flush with the floor, or lip of the shower pan, unlike an insert which can protrude above the shower pan. 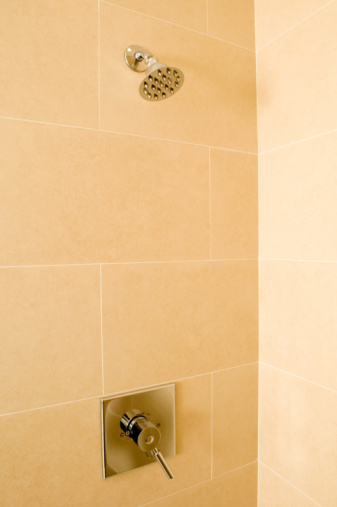 A poured shower pan, can be installed at extra cost. This type is semi-permanent and expensive. Similar to inserts and planked floors, teak tiles attach to a grid, typically placed over a shallow tub. Tiles have short planks, usually with grain patterns running at 90-degree angles to each other, to allow for better aesthetics. Tiles perform just like the others, allowing water to pass through them. Remodeling with teak can be affordable with the addition of a custom shower base. They're designed to fit over the shower floor, and connect to the existing drain. Teak is then used as an accessory for the addition of planking, tiles, shelves and benches. Teak, even though it's superior at resisting moisture, ages just like any other wood. It might take a few years, but teak turns a silvery-gray color over time. Colored products such as shampoo, dyes, salts, gels, soaps or other chemical products can stain teak. Products with color are the most likely to stain teak. Stains are very difficult, if not impossible, to remove by scrubbing. However, stains can be sanded off if they're not too deep. Teak, just like any other wood product, can absorb only so much moisture. It shows up as raised grain, which means that grain lines raise up, and compromise the smooth finish. Regular scrubbing with a stiff brush and soapy water can alleviate part of the problem, but scrubbing and cleaning can stain teak. Teak requires periodic oil treatments to maintain it's luster. In order to apply the oil though, the teak must be dry, which can take a few days. During that time you'll be without a shower. Abrasives like salts can damage teak. Sand, pebbles or dirt that might have been tracked into the shower can also scratch the delicate surface of teak. Mold and mildew, even though teak is resistant to it, can grow between and underneath teak planks or tiles. However, if you're using an insert, it can be removed to clean the mold off. Adding a teak shower insert is a moderate investment, because the drain is already in place. But if you're installing teak from scratch, the process is generally more expensive than tile, because of the extra labor involved -- you still need waterproof flooring, pan or tile underneath -- and expense of buying teak, which runs in excess of $20 per board foot at the time of publication. Like many woods, teak fluctuates in price.